Born out of a love of good music, Swing That Cat! is on a mission, with a simple message: Dance your Tail off! 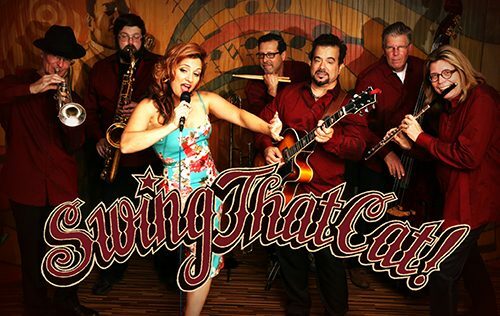 Inspired by Swing evolving into Jump Jive, Rock & Roll, and Bebop, this NJ-based female-led band has a sound that makes their audiences shimmy and shake. Front and center is Michele Peraino, a modern-day Rita Hayworth meets Catwoman, with a vocal range and style drawn from another era, and a performance that captivates the crowd. Playing 120 shows in 4 years, Swing That Cat! were nominated in 2016 for WSTW Hometown Heroes as Best Live Band.